Veterans Memorial Park will serve as a venue for veterans funerals, first time enlistments, military and non-military weddings as well as military and civic holiday activities. This will not be a children's park with athletic fields, playground equipment, or sporting events. This will be a "green" park and the first of its kind for the community. The SCRVG want to teach by example by including in the park design innovative eco-friendly technologies such as rain gardens, native plantings and permeable pavement. 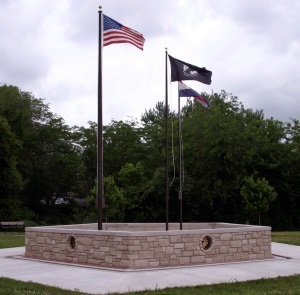 Veterans Memorial Park will include such features as an amphitheater with dais, a POW/MIA memorial gazebo, a water feature and a six foot wide walking trail featuring monuments detailing the history of all major US military engagements. The park will be fully handicap accessible and open to all. This project will provide instant stimulus to the economy of the area through both the purchase of materials and employment of people in various fields of expertise.